In The Age Of Digital Medicine, The Humble Reflex Hammer Hangs On : Shots - Health News Nearly 130 years since its inception, a modest knob of rubber with a metal handle is still invaluable in diagnosing disease and avoiding expensive testing. But its history is anything but simple. 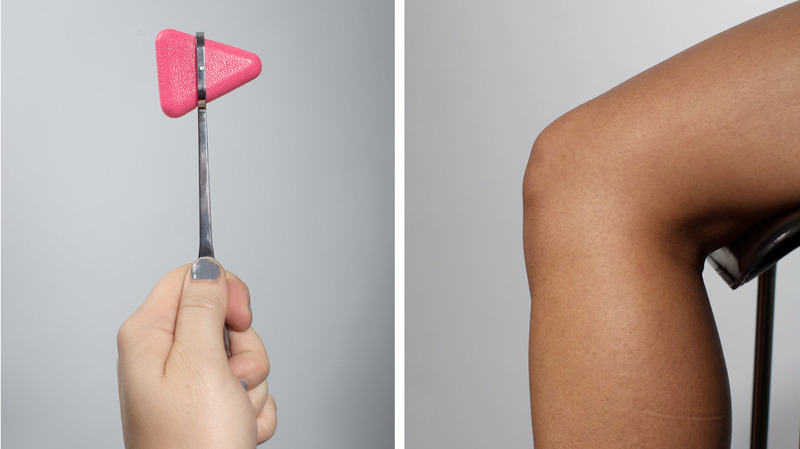 The good old reflex hammer (like this Taylor model) might seem like an outdated medical device, but its role in diagnosing disease is still as important as ever. Receiving a diagnosis in 2017 — at least one made at a medical center outfitted with the latest clinical gadgetry — might include a scan that divides your body into a bread loaf of high-resolution digital slices. Your DNA might be fed through a gene sequencer that spits out your mortal code in a matter of hours. Even your smartphone might soon be used to uncover health problems. Yet nearly 130 years since its inception — after decades of science has mapped out our neuronal pathways — a simple knob of rubber with a metal handle remains one of medicine's most essential tools. I'm referring to the cheap, portable, easy-to-use reflex hammer. This unassuming device can be invaluable in diagnosing nervous and muscular disorders, and in determining whether a patient's pathology lies in the brain or elsewhere in the body. It can also help curtail health care spending by preventing unnecessary, often expensive testing. Yet like so many major medical and scientific discoveries, the reflex hammer has humble origins, in this case: the basement of a Viennese hotel. The inn was run by the father of Leopold Auenbrugger, an 18th century doctor who is considered to be among the founders of modern medicine. To gauge how much wine was left for customers, hotel employees would thump casks with their hands and listen for a dull thud or hollow tympany. Auenbrugger realized that the same technique — now called "percussing" — could be applied to the human torso to, say, determine how much fluid had built up around a diseased heart. He wrote as much in his 1761 paper "New invention to detect diseases hidden deep within the chest." 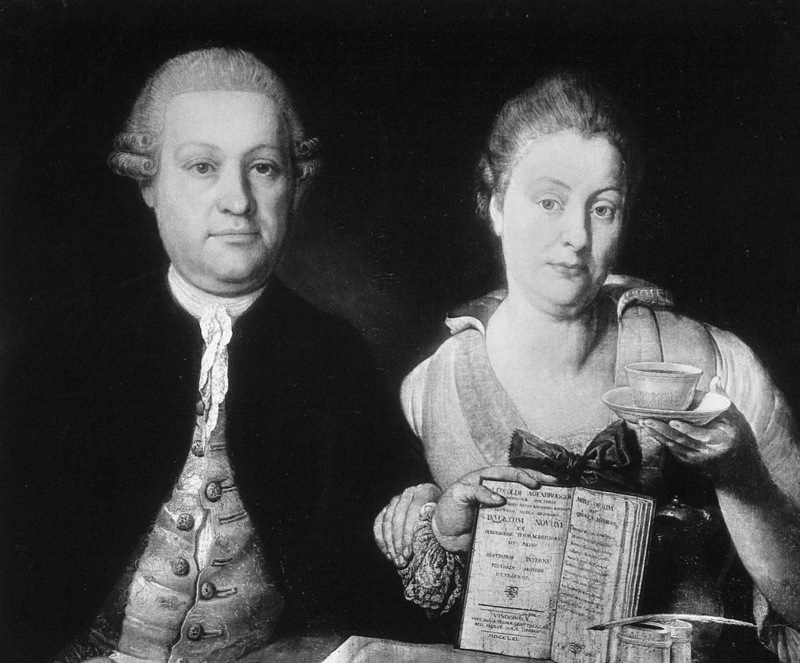 Leopold Auenbrugger (here with his wife, Marianne) is regarded as one of the founders of modern medicine, having applied the idea of detecting disease by sound. Thought to be more accurate than the human hand, it wasn't long before percussion hammers were being designed to more precisely diagnose disease. Competition ensued. Scottish physician Sir David Barry's model, released in the 1820s, was the first. German doctor Max A. Wintrich's came shortly after and was more popular, but was not without its critics: "[Wintrich's hammer] is inconvenient to hold, it is rigid ... it required education to use it, and even then it does not fulfill its purposes," a rival inventor commented. As neurologist Dr. Douglas J. Lanksa wrote in a 1989 paper on the many types of reflex hammers, "Some were T-shaped or L-shaped, others resembled battle axes, tomahawks, or even magic wands." He adds that no material was off limits: wood, ebony, whale bone, brass, lead, even "velvet-covered worsted" (a type of yarn). As percussion hammer warfare waged on, doctors and scientists were also beginning to understand the concept of reflexes, or involuntary, near-immediate responses to stimuli that occur before any sensory information reaches the brain. Muscular jerks. Blinking. Sneezing. Gagging. All of these are automatic feedback loops between sensory and motor neurons that help us navigate our environment and protect us from danger. In 1875, German neurologists Drs. Heinrich Erb and Carl Friedrich Otto Westphal were among the first to realize that eliciting a reflex by briskly tapping the tendons of major muscles might be useful. They felt the knee jerk — or "patellar-tendon" reflex — in particular could help assess nerve function. 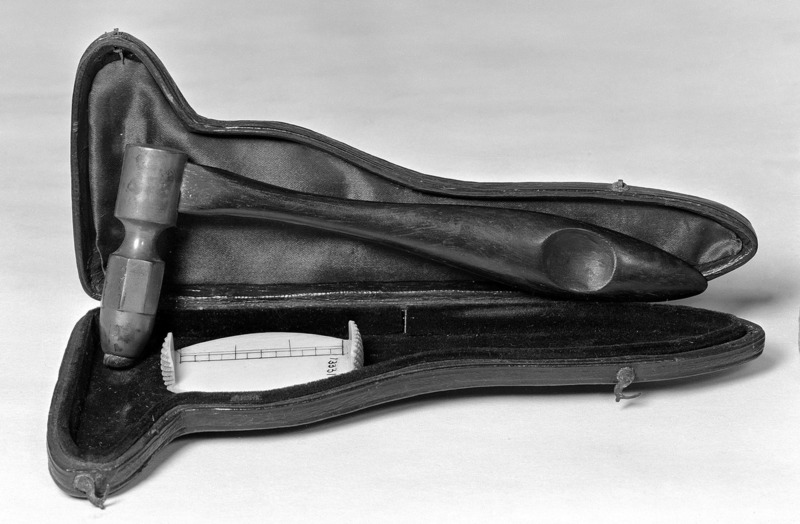 Anton Wintrich introduced this percussion hammer model in 1841. Hammers specifically suited to test reflexes were soon developed, the first of which had the now classic shape we're accustomed to — a thin metal handle with a triangular rubber head. Designed by American physician John Madison Taylor in Philadelphia in 1888 — and modified ever since by many — the simple device was heavy enough to elicit reflexes, and had round edges to ease impact. An entry level model runs just $2.25 on Amazon. The Krauss hammer, developed by German-American physician William Christopher Krauss, was designed around the same time. It had two rounded heads: a large one for knees and a smaller one for biceps. Dr. Ernst L.O. Trömner's did too, but it also tapered to a thin end to assess skin reflexes. There were also the Queen Square hammer, the Babinski hammer, the Buck hammer and the Berliner hammer. The Stookey hammer flaunted a camel hair brush to get a better sense of touch sensation. The list goes on. Daniella C. Sisniega is a third year medical student at the Boston University School of Medicine. Last month at the American Academy of Neurology's annual meeting, she presented a poster explicating the reflex hammer's past. "I'm fascinated by how the reflex hammer started out as a percussion hammer, but was [then] adapted to elicit reflexes and has been in every neurologist's tool box ever since," she told NPR. "I also did not know that the little rubber triangle was the first reflex hammer. I feel like I owe it an apology!" You Can Monitor Heart Rhythm With A Smartphone, But Should You? Sisniega jokes about the lackluster quality of the inexpensive Taylors. "The little tomahawk is included in the kit everyone receives when they enter medical school," she recalls. "The rubber is cheap and very light, while the other hammers are heavier on the head so that you can use the 'swing' of the hammer as opposed to the strength of the strike to test the reflex." While attending the AAN conference myself, I asked multiple sclerosis expert Dr. Stephen Krieger about the role of the reflex hammer in modern medical diagnosis. "We could argue about the nuances of the hammer — the Queens Square, the Tomahawk, plastic handle, metal handle, weighted, flexible or rigid — but the hammer itself is always in the hand. Reflexes tell the story of neurologic diseases of all sorts," he says. Krieger explains how disorders of the brain, like a stroke or brain tumor, result in hyperactive reflexes, while conditions affecting muscles and peripheral nerves usually result in reduced or non-existent reflexes. Reduced reflexes are, for example, a common symptom of back pain due to degenerative disk disease. Dr. Andrew Wilner, an assistant professor of neurology at the Mayo Clinic, recounted the story of one of his patients, who had back pain, weakness and numbness of the legs. Wilner was leaning toward a diagnosis of either Guillain-Barre Syndrome (GBS) — an autoimmune disorder of peripheral nerves — or a myelopathy, an injury of some kind to the spinal cord. Both conditions can lead to medical emergencies, but each requires drastically different treatment. "The reflex hammer was arguably our most important tool in narrowing down the differential diagnosis," he says. "Had we found diminished or absent deep tendon reflexes, GBS would have been more likely. As it turned out, the patient had brisk pathological knee jerks, pointing to a lesion in the brain or spinal cord." Based on these findings, Wilner ordered an imaging study of the patient's spinal cord, where a lesion was found — as opposed to pursuing the costly tests involved in a GBS diagnosis. Wilner feels that the simple art of interviewing and examining a patient can get overshadowed by the myriad new diagnostic technologies. When it comes to clinical tools, he feels, sometimes basic is better. "Technology is glorious," admits Krieger, "and [it] will teach us things about patients that we could never have known or imagined. But the simple, elegant, inexpensive almost plebeian swing of the reflex hammer has a cost/benefit ratio that I think no advanced technology will likely ever match."